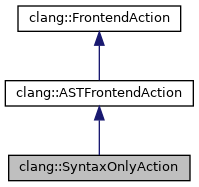 Definition at line 151 of file FrontendActions.h. Definition at line 310 of file FrontendActions.cpp. This routine is called as part of BeginSourceFile(), which will fail if the AST consumer cannot be created. This will not be called if the action has indicated that it only uses the preprocessor. CI - The current compiler instance, provided as a convenience, see getCompilerInstance(). InFile - The current input file, provided as a convenience, see getCurrentFile(). The new AST consumer, or null on failure. Definition at line 314 of file FrontendActions.cpp. Definition at line 158 of file FrontendActions.h.